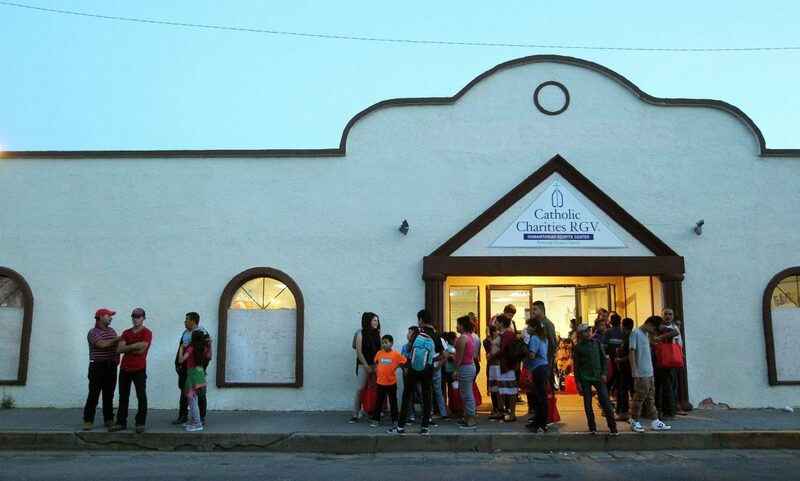 Central American families wait by the entrance of the Catholic Charities Humanitarian Respite Center before boarding a van to be shuttled to a near by church in Alamo to spend the night on Tuesday, June 26, 2018 in McAllen. McALLEN — After the last several years of tens of thousands of immigrants briefly staying at a temporary humanitarian respite center downtown, a nationwide competition launched Thursday for design teams to submit drawings and renderings for a new, permanent shelter. The official competition, run by Catholic Charities of the Rio Grande Valley in conjunction with Georgetown University, has a deadline of Nov. 11. Interested applicants can apply on the Archdaily platform online. The new building will cost no more than $4 million, according to Sister Norma Pimentel, the director of Catholic Charities of the RGV. Earlier this month, Pimentel announced a campaign to raise $5.5 million for the new building. Those funds will go toward the building itself. Construction on the permanent respite center, which will be located on the corner of Chicago Avenue and 16th Street, will likely begin in 2019. Pimentel hoped for an opening at the beginning of 2020. For now, immigrants temporarily passing through the Valley will continue to stay at the Catholic Charities humanitarian respite center on Beaumont Avenue near Bicentennial Boulevard, behind Bentsen Tower. The respite center has been flooded with hundreds of immigrants every day in recent months, so donations and funding are critical to its mission.